I don’t know if you can really call this Italian food. I think it is definitely American. But nonetheless it’s fantastic. 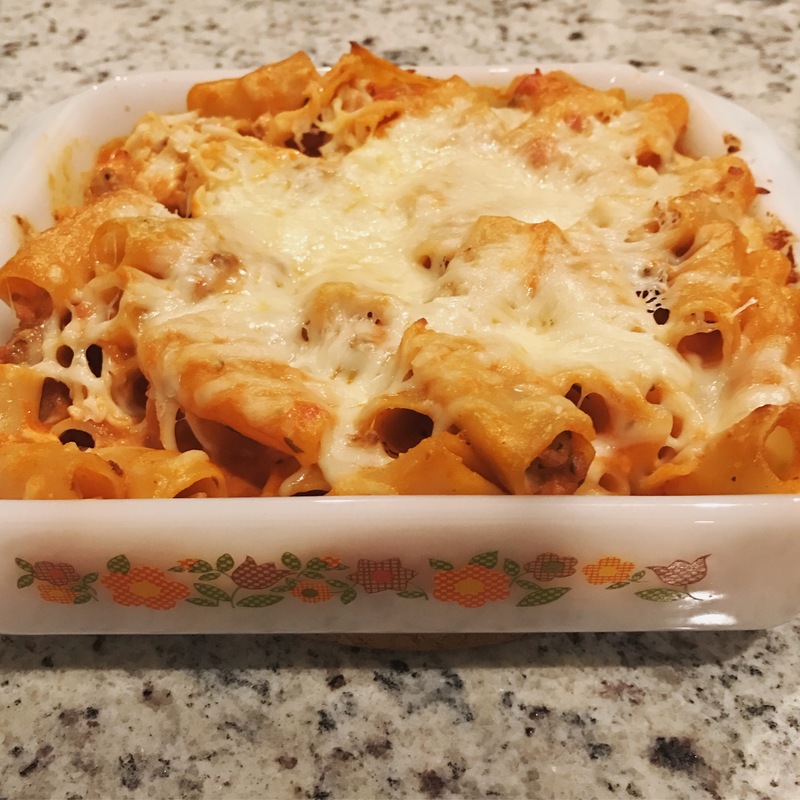 This recipe has really surprised me, it just keeps getting better and better. And it makes the best leftovers! You can prepare this in a 13×9 inch pan or you can make it in in two 8 inch square pans. I really like to freeze one of the pans. I just line line the pan with two layers of foil, dump the ziti in, freeze for a couple of hours. I then take it out of the pan and wrap it generously with foil and place in a large gallon ziplock freezer bag. Then when you are ready to bake, just unwrap and put it back in a square baking pan. This is a technique I use for all kinds of recipes: Cheesy Chicken and Rice, Cheesy Chicken Enchiladas, Lasagna, Everything Breakfast Quiche. It is pretty rare that someone peeks into my freezer and doesn’t find one of these casserole-esque recipes frozen and ready to bake. When my husband said, “I am gonna get a blow torch to sear the prime rib with on Christmas,” I was a bit concerned. But the truth is, it was a lot less dangerous than it might sound. And it was absolutely wonderful. It was actually very simple to make and well worth the 4 hours in the oven. This recipe is adapted from Thomas Keller’s Ad Hoc at Home. 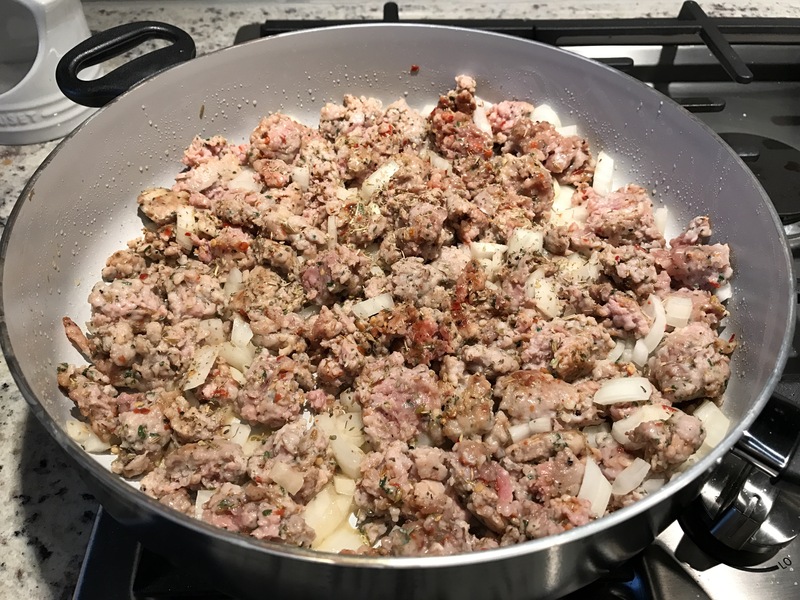 One of the things he emphasizes is letting the meet rest, before and after cooking it. 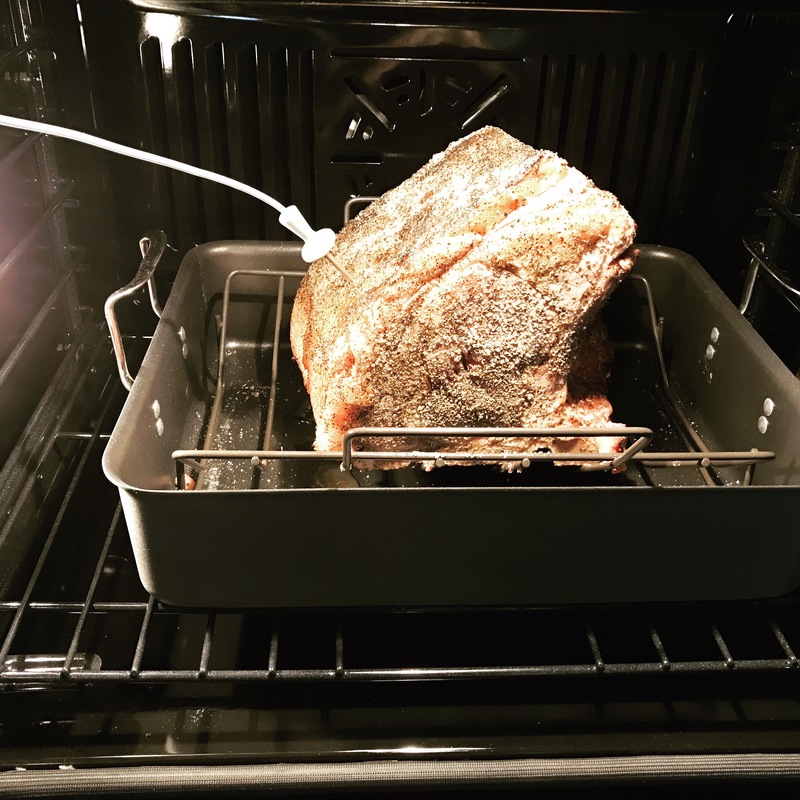 The prime rib should sit out at least 30 minutes before you blow torch it. Keller also dictates that you should season the meat 30 minutes before you cook it. 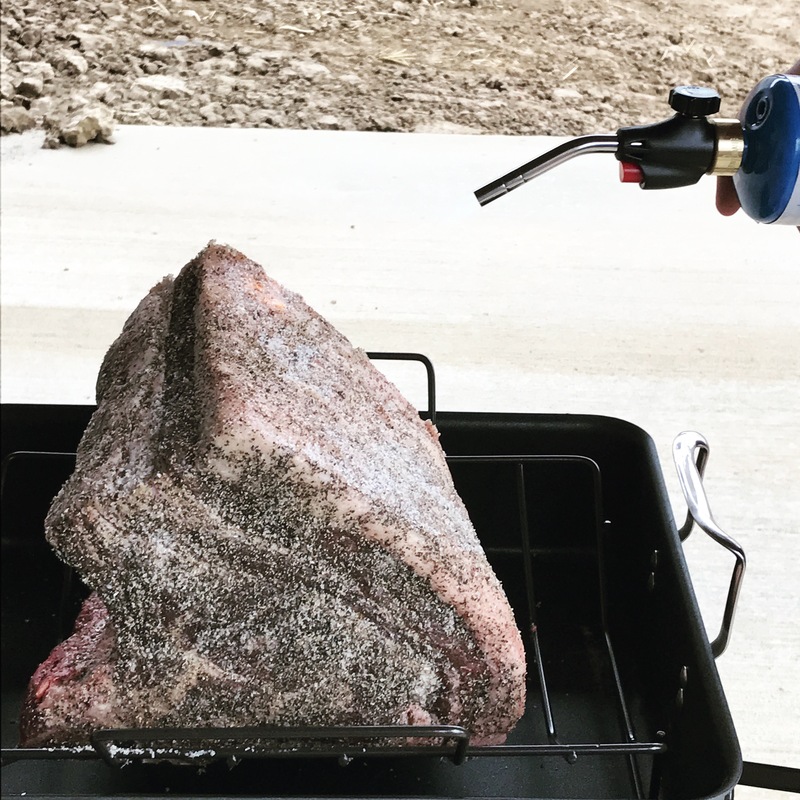 Rub your prime rib generously with salt and pepper and let that soak in for at least 30 minutes before you fire up the blow torch. And after the prime rib is cook, leave it alone! We let ours rest one hour. And it was more tender and more juicy than I could have imagined. Thomas Keller is very emphatic that you need a regular old propane blow torch from the hardware store. Not one of those sissy butane torches from a kitchen store. For safety, Andrew blow torched our prime rib outside on the charcoal grill. It was quite easy, no real mess to clean up, and probably safer than firing up a blow torch in your kitchen. I shouldn’t have to say this, but please be extremely careful if you try this recipe. Which you absolutely should. Because you haven’t really lived until you blowtorch a 10 lb piece of meat for dinner. The recipe below is for a roast that is 4.5-5 lb. You can adjust the cook time appropriately depending on the size of your rib roast. As far as where to get the meat? We like to get our prime rib from Local Pig, well we like to get whatever meat we can at the Local Pig. If you don’t live in KC then I do suggest you find a local butcher to source your meat from. A 4 bone prime rib will serve about 8 to 10 people. Also, whatever you do, do NOT discard the bones and fat you cut off the roast. Freeze them! They will make a fantastic beef stock. Prime rib has to be one of the easiest things I have ever paired wine with. For some reason I always have a surplus of fabulous cabernets and cabernet blends in my wine fridge. I honestly feel cabernet might be the hardest wine to pair with food. It can easily overpower a meal. I have discussions with new wine lovers all the time who say “I don’t like chardonnay” or “pinot/merlot is too watery.” It seems like a lot of people think cabernet sauvignon is the definition of wine. I completely disagree. Part of anyone’s journey with wine is learning about new wines, new varietals, and trying different things. And the truth is, if you have never drank wine and are just starting out, cabernet is the last wine you should be tasting. I love cabernet, don’t get me wrong… But I cannot drink cabernet everyday or with every meal. However, you should serve this prime rib with nothing other than cabernet. I would recommend a Napa cab and considering you are likely serving this meal for a special occasion, open a special bottle of wine. Kathryn Hall Cabernet Sauvignon is an excellent wine that has the ratings to prove it. We have a few bottles of 2012/2013 in the cellar and don’t plan on opening them for at least 5 years. But if you can snag a 2010 or earlier bottle, it is worth every penny! Place your oven rack in the lowest position, removing other racks as needed to allow space for your rib roast. Preheat the oven to 275 degrees. At least 30 minutes before you plan to cook the meat, take it out of the fridge. Rub it generously with salt and freshly ground black pepper. (This recipe literally has 3 ingredients so, be generous with the salt and pepper). Place the roast on the rack in a roasting pan. (Or if you are nervous like we were, put it on your charcoal grill.) Hold a blowtorch about 1 inch from the meat and lightly brown the fat on all side. Some of the fat should melt off the meat. The edges of the meat should be starting to turn gray. Sprinkle it again with salt and pepper to make sure you have a generous coating. Transfer to the oven, try to place the roast in the center or towards the back. Cook for 2 hours until a thermometer reads 128 degrees. Check the temperature at 1.5 hours just to be safe. When carving the meat, cut the meat away from the bones first. Cut the roast in half. Turn the pieces so the cut sides are facing down. Slice into 1/2 inch slices. Arrange the meat on a platter and sprinkle with salt and pepper. Adapted from Ad Hoc at Home.